Miguel Diaz, missing since yesterday afternoon, has been located and taken to hospital to get checked out. Thanks for the RTs. Vancouver police are asking for the public’s help to find an elderly man with dementia. Seventy-six-year-old Miguel Diaz was last seen yesterday at 1 p.m., walking near his home in the area of Joyce Street and Vanness Avenue. He regularly goes for walks and is capable of walking long distances and using public transit. Mr. Diaz is Hispanic, 5’7″ tall, with a medium build. He wears glasses, has short black hair and a moustache, brown eyes, and a medium complexion. His right arm is currently in a sling. He was last seen wearing a green hooded winter jacket, blue jeans, and white slippers. Miguel is likely confused or disoriented and may be in need of assistance. If you see him, please call 9-1-1 and stay with him until help arrives. 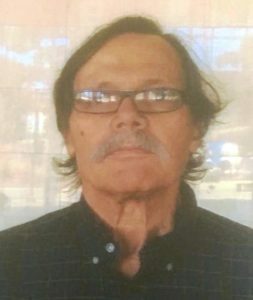 This alert, "CANCELLED: Missing 76 y/o Miguel Diaz near Joyce Street and Vanness Avenue" imported on 2018/10/17 15:46 was originally posted to the "VPD Media Releases" web site and is provided here for alerting purposes. Please see the original post for authoritative information and updates on the missing person. Posted in 2018 Alerts, Cancelled and tagged Vancouver.